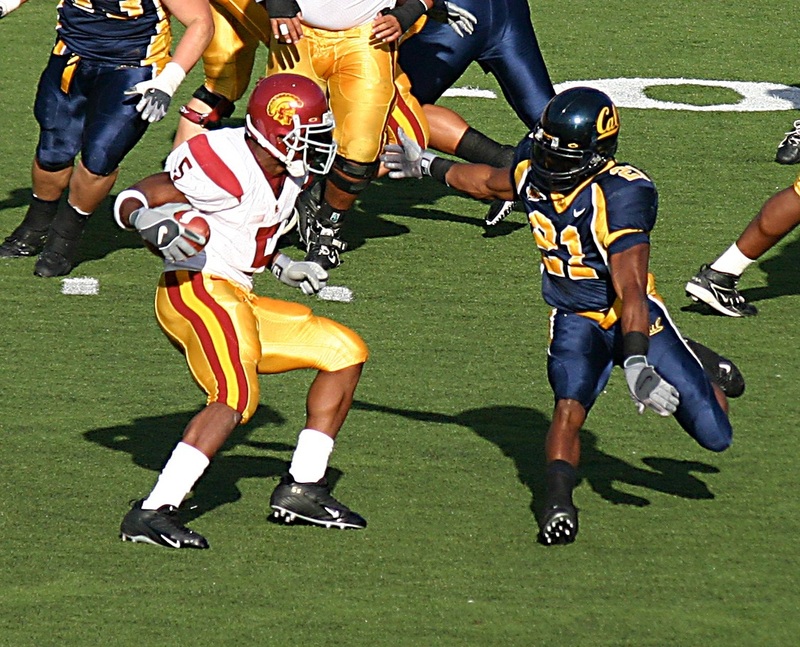 Zach Bahner is another writer in the RSP Writers Project who is a Reggie Bush fan Photo by JSnell. Zach Bahner is an analyst at NFL Draft Hub. Bahner is a Miami Dolphins, Indianapolis Colts, and Notre Dame Fighting Irish fan, which is an odd combination when one considers that most Miami Dolphins fans are Miami Hurricanes fans. Bahner’s team has some personnel fresh to this project and I’m intrigued with what he intends to do with them. What I like about Banher’s team right away is that his players tend to be second- and third-year veterans on the verge of their prime. For more information about the RSP Writers Projects and how to build your own team, check out this link. This team relies heavily on player versatility. Reggie Bush and Percy Harvin will both be lining up in the backfield and at receiver. There will be times that Tolbert, Bush and Helu are all on the field at the same time. The idea is to create mismatches and make the defenses second guess the personnel. One thing this team won’t be utilizing is the Wildcat. Keeping Locker under center will be critical to this team’s success by setting up the play action pass This team is designed to run the power blocking scheme. This will be a run heavy offense, so I have big, strong linemen to push around the defenses. The team’s bread and butter plays will mainly be based off of play action. Since this is such a run dominant team, both with backs and Locker, teams will be caught off guard by passing on any down. This team will also have a lot of screens worked into the playbook targeting Bush, Helu, Harvin, Rudolph and Fleener. Harvin, Bush, Helu and Locker will be the most important players for this offense. The offense has enough depth that it will be able to function if it loses one of these players, but it will severely weaken the versatility and ability to move players around. The ideal coordinators for this offense would be Tony Sparano or Todd Haley. Sparano and Haley rely on a strong rushing attack to set up the pass. Bill Cowher would come out of retirement to be the head coach. The goal of this defense is to get to the quarterback and sack him or force him to throw interceptions. There is a relative weakness against the run, and the defensive tackles aren’t ideal for the scheme, but I wasn’t satisfied with comparably price tackles. While the tackles are somewhat wrong for the scheme, they are big bodied and will plug up the middle of the line to stop the run. The goal for the line is to stop the run on the way to the QB. At times the defense will utilize the wide nine technique. The linebackers would be more concerned with coverage. They would run a read and react style of defense. The defense would play both man to man and zone coverages. In nickel packages Zach Brown will come off the field, Tracy Porter will cover the slot and Kareem Jackson will cover the RCB position. This defense will rarely be in sets with only three down linemen due to the relative strength of the line and weakness at the LB position. The ideal defensive coordinator would be Perry Fewell or Juan Castillo. Both of those coordinators have a defense predicated on attack the opposing QB and forcing mistakes. The biggest vulnerabilities this offense has are at the quarterback and right tackle positions. Ideally this team would target a tackle in free agency or the draft after the first year. Locker needs more time to develop, but his skill set is perfect for what this offense hopes to accomplish. To minimize the weakness at RT, we would frequently chip the right end with a tight end or running back. A balanced run attack split between runs at both sides and the middle of the line would be used to neutralize the weakness at right tackle. By not shying away from running anywhere, the defense won’t have the opportunity to key on the right side. If the tackles are not able to get good penetration, this defense will not fare well. The tackles need to eat up defenders to allow the linebackers to read and react to the plays run by the offense. Depth at cornerback is a little suspect, as well. That would need addressed in the early rounds of future drafts. This team really isn’t loaded with “stars.” The idea was to have a balanced attack on both sides of the ball. Locker, Harvin, Kalil, Pouncy, Claiborne, Curry, Claiborne, Branch and Byrd would likely be the players that could eventually get Pro Bowl consideration if the system worked as planned and players developed accordingly. Both Kyle Rudolph and Coby Fleener would be role players with the potential to be absolute studs in this system. They would both get a high amount of targets due to the use of underneath routes. I would call both Bush and Helu role players, but in fantasy terms they should out up RB2 and RB3 stats respectively due to the frequency that they would both be on the field. Vinny Curry would start as a pure pass rush specialist with the upside to be an every down star player. If Kareem Jackson continues to develop, he would take over as starter at RCB for Tracy Porter. George Iloka could end up taking over as a starting safety if anything happened to Branch or Byrd. I would consider Jason Smith on the roster bubble already. I typically don’t like having any holes on either offensive or defensive line, but with the salary constraints, he was my favorite for the money. If he doesn’t perform to expectations, he could be cut in the offseason. If Will Smith gets in any more trouble, he could be on the bubble as well. The most difficult process for me was the special teams sections. Since I deal mostly with fantasy football and draft situations, I don’t get as much of an opportunity to focus on which players contribute well there. My special teams could be terrible for all I know. Getting solid depth at offensive line and linebacker was difficult, as well. This team would be idea for an outdoor open air stadium with grass in any climate. In the rain and snow, this team would use it’s physical rushing attack to keep the defense off balance. Jason Smith was a risky signing because he hasn’t lived up to his draft stock so far. Reggie Bush is risky due to his vast injury history. Dennis Dixon is also a risk. If Locker goes down, Dixon has to be able to run a complex offense with a lot of shifts and motion. If he can’t handle it, this team will not perform at a high level. Will Smith is a major risk due to his suspension history. Zach Brown is a risk due to being a rookie forced into a starting role. There could be some growing pains with him. The defensive tackle position as a whole is a bit of a risk due to having four players that are ideal zero techniques that will be play the 3 and 5 tech. I really wanted to have a more top flight pass rusher like Jason Pierre-Paul or Cliff Avril on the team, but I just couldn’t afford them. I also would have liked to pay for a more experienced second starting WR, but I like LaFell’s potential. Based on the fact that I spent the entire cap, I don’t think there is a single player I would have paid more for. I believe in a team effort. Nobody is bigger than the team. If a player needs to leave because he isn’t happy with his money, he will be replaced. Every player has his role and has to work as a unit to make this team successful. Sadly, that isn’t true in the NFL. There would most certainly be players that would leave this team because they thought they were bigger than the team. I would say I don’t completely line up with conventional wisdom. I spent more money on the running back position than I think most others will. I expect most teams to only spend 7-8 million on the RB position where I spent 11.5. I think overall my salary is much more balanced than most teams will be. One area that does line up with the NFL is my focus on the pass rush. Good teams know that you have to sack the QB to win. I am completely unqualified to answer this question. I have so little special teams knowledge that I can’t do this question justice. I did my best to add a few players that I knew were special teams studs (David Clowney, AJ Edds), but beyond that, I just had to swing for the fences.